Congratulations on receiving a grant or fellowship through Maryland Sea Grant. As a funding recipient, you have additional opportunities and are responsible to abide by a number of guidelines and requirements to ensure continuation of your grant. Reporting: Progress Reports and Final Reports are extremely important for describing the impacts, accomplishments, products, and outreach that were accomplished during the life of a project. All funded projects must submit reports according to their assigned schedule. 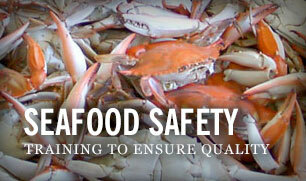 Reports are submitted via Maryland Sea Grant's eSeaGrant system. Existing grantees should user their email login generated by the system. Please use the forgot password link to retrieve a new password, as we do not have access to passwords. Contact Dr. Michael Allen, Associate Director for Research and Administration, for further questions. Attributions to Maryland Sea Grant: Sea Grant-funded (or supported) projects require attribution and funding acknowledgement. This page offers Sea Grant logos and guidance for attributions and disclaimers regarding funding from Sea Grant. Publication notification and reprints: Please notify us when Sea Grant-funded (or partially Sea Grant-funded) work will be published. Please include full citation and send us a pdf of the publication when it is available. Maryland Sea Grant can in some instances pay for reprints. Contact Dr. Michael Allen, Assistant Director for Research, for further information. Share your research: Investigators funded by Maryland Sea Grant are strongly encouraged to engage with relevant audiences beyond academia to share research knowledge and insights developed with this funding. Here, we provide guidance and resources for potential outreach. Data sharing: Read also our requirements that you make data from your project accessible to the public. Maryland Sea Grant Research Fellowships: We invite researchers who have already received notice of a pending funding award from the program to apply for additional funding to support a graduate student as a Research Fellow.